Try this disappearing nine patch quilt pattern if you love to make quick pieced quilt blocks and quilts. To make the quilts, a simple nine patch quilt block is sliced in half twice to create four smaller units. Take a look at another tutorial, How to Make a Disappearing Nine Patch Quilt. The disappearing nine patch technique seems to have developed over time, and from the work of many quilters. Pirate, a member of our Quilting Forum, found a few answers about the history of the technique when she made her own disappearing nine patch quilt. Karin Hallaby wrote a book in 2002, called Magic Pillows, Hidden Quilts. The book included a Magic Nine Patch quilt made using the same technique that's so popular today. Nancy Brenan Daniel wrote a book called Disappearing Nine Patch in 2002, but the design we associate with that phrase is not one of the quilt designs used. Ms. Daniel used the phrase again in a later book. A blog by Helen Bailey, with a tutorial about her own use of the disappearing nine patch, helped popularize the term. Ms. Bailey did not coin the phrase and mentioned that a Yahoo group had used the term early-on. The same technique has been called Tossed Nine Patch (by Eleanor Burns) and 9 to 4 by other quilters and authors. Sometimes it's a little difficult to wrap our heads around the final look of quilt blocks produced using this technique, and the contrast that will occur when the nine patch blocks (let's call them parents) are cut apart (resulting in the daughters) and then reassembled. The center square of a parent nine patch block will turn into a small corner square in each daughter when the parent block is sliced into four sections. 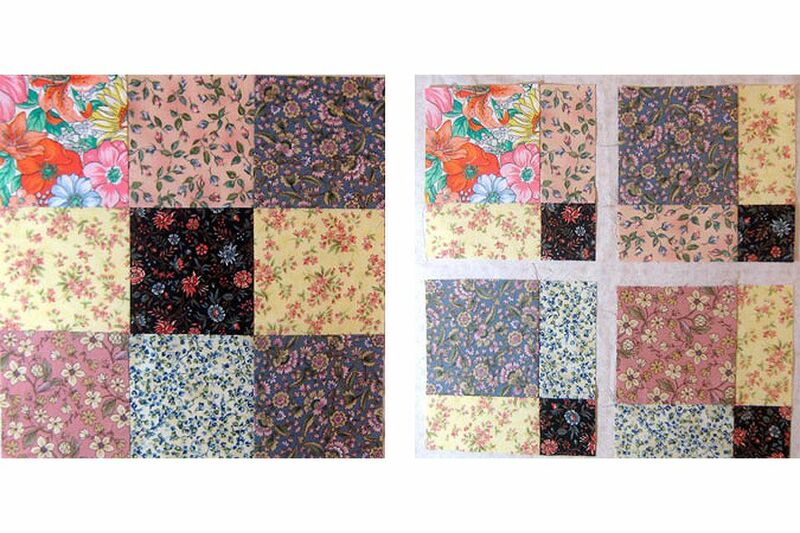 Choose a dark (or hot/warm) fabric for the center to make those small squares pop out when the daughters are arranged into a quilt layout. Squares that touch the parent's center squares (midpoints of the outer rows) are also sliced, and become each daughter's outer bars. We think they look good when sewn as either lights or mediums that contrast with the center. Squares sewn in the four corners of the block are the only pieces that remain their original size (minus the seam allowance). They should contrast with the midpoint squares mentioned above. Having said all of that... keep in mind that there are no rules. Try placing your darkest square in one corner, and then fill in the other slots with light and medium squares. Assemble the nine patch in a traditional way, looking like an X -- with dark squares in the center and four corners and lighter squares in the four remaining positions. We love watercolor quilts, sometimes called colorwash quilts, where floral fabrics of all types seem to melt into each other, but still have a bit of contrast for definition. Here's an example of a split nine patch quilt we did many years ago in the watercolor style. The quilt was strip-pieced, so the patches don't blend quite as well as they might have in a quilt sewn one patch at a time, but we was happy with the result. Experiment a bit to create your own unique quilt blocks from the basic pattern, and then take some time to play with the endless layouts possibilities. 3-1/2" parent squares: daughters finish at 4-1/4" x 4-1/4"
4-1/2" parent squares: daughters finish at 5-3/4" x 5-3/4"
5-1/2" parent squares: daughters finish at 7-1/4" x 7-1/4"
Again, any size squares will work -- if the quilt will be constructed entirely of same-sized daughter blocks, they'll all match in size as long as you sew and cut accurately. Squares do not have to include a fraction. Do you have a collection of 5" x 5" fabric squares, either purchased or received in swaps? Perfect -- daughters will finish at 6-1/2" x 6-1/2". Divide a parent's finished size by 2, and then subtract 1/4" to find the finished size of each daughter. This floral version of the Disappearing Nine Patch quilt block was used for a previous forum event. Alter fabrics selections in any way you wish. Cut 9 squares, each 4-1/2" x 4-1/2"
Sew with a quarter inch seam allowance. Arrange the squares into three rows, each row with three squares. Place the dark square in the block's center position. Place the light squares in the block's four corners. Fill in the midpoint gaps with the medium squares. Sew the components of each row together. Press seams in adjoining rows in opposite directions. Join the rows, butting seam allowance lofts for a perfect match. Secure the fabrics with straight pins to keep them from shifting. Press. The parent block should measure 12-1/2" x 12-1/2". It's important that the block is accurate. If it's skewed, or a bit small, press the block again and remeasure. Adjust your seam allowance for another block if necessary, sewing a scant 1/4" seam. Use a rotary ruler to slice the block in half once vertically. Each half of the block should be 6-1/4" wide. The 6-1/4" vertical rule should run perfectly down the left side of the block and the bottom of the block should align with a horizontal line of the ruler (see photo above). The block's midpoint is critical, so if your seam allowances are a tad off, be sure the cut will flow down the midpoint of the parent block. Repeat to make additional quilt blocks. You can make a strip pieced quilt, either orderly or somewhat scrappy. Read more about strip piecing if the technique is new to you. Choose a square size and determine how you wish to position fabrics. Using the width you chose, cut strips of each fabric from selvage to selvage. Sew three strips together lengthwise to create three strip sets that look like the three rows of your block. Square up one end of each strip set. Cut segments from the strips sets, each the same dimension as the width of your original strips. Sew segments together to create the block, and then slice the block in half as described above (slicing dimensions will differ based on your strip width).